"Being vegan myself, I was used to reading food labels and I thought 'Why aren't I giving the same attention to my pets’ food?'" That’s what led Marlene Doyle to create Lucky Dog Treat Company in 2007. "I felt I could put out a product that contained only organic ingredients with no preservatives and things that people could easily read and understand and know where it came from." Located in Willow Grove, Lucky Dog makes a variety of dog treats sourced as locally as possible, including some without wheat, gluten, corn, soy, meat products, sugar or dairy. See the recipe below to make your own. 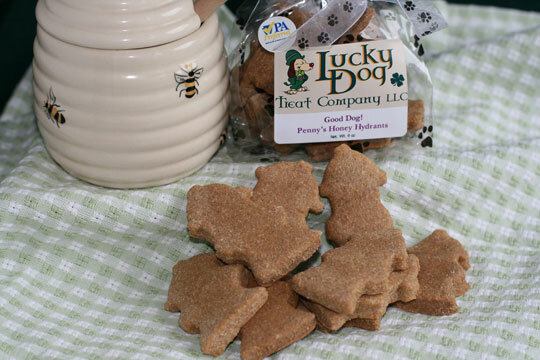 Lucky Dog treats are available at the Groom Studio in Glenside, Weavers Way Food Co-op in Chestnut Hill and Mt. Airy, and Whole Foods in Jenkintown. Keep a little extra flour on hand to dust while rolling out the dough (it gets very sticky). A nonstick rolling pin comes in handy for this recipe. Mix all ingredients, then knead dough on a floured surface. Roll out dough to about 1/3-inch thickness, or thinner for a crispier treat. Cut out shapes with a cutter of your choice. Place biscuits 1/2 inch apart on a baking sheet lined with parchment paper. Bake in a 325 degree F oven for 15-20 minutes until firm To harden the biscuits, turn the oven off and leave the biscuits inside for 1 to 2 hours. Using this process, you will want to keep them in an airtight container in the refrigerator. They should be eaten within a week or so. You can also freeze extras to prolong freshness. This story is from page 33 of our Countdown to the Holidays feature in our December 2013 issue.